The combination never worked. Even before the shift to Ducati the experts knew that Cal’s riding style was not suited for the current Ducati plagued by under steer. Cal Crutchlow a rider depended on edge grip to maximize corner speed never settled down on that Ducati and has had a terrible season so far crashing out several times and not being anything close as competitive he was on the Tech3 machine. The factory rider label might have been too much an attraction but we for one are terribly happy that he has moved on and not let ego challenge his stay. 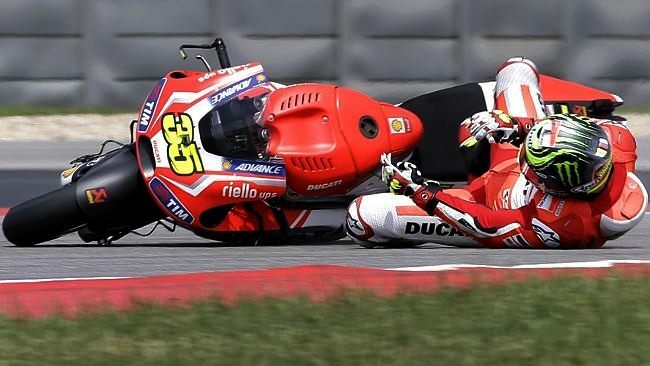 It leaves the world a better place, the vacant seat will be taken my Andrea Iannone who will join Andrea Dovizioso, both of whom seem to have come to some sort of terms with handling the Ducati. Cal’s future seems to be at LCR Honda in place of Stefan Bradl who in all probability will move to the Forward Racing team. Aleix Expargaro will move from the Forward Racing team to Suzuki along with Alvaro Bautista. Scott Redding will then get hold of Bautista’s factory bike. Leaving a spot vacant there, time will tell who goes there. Phew! The 2015 season already heating up!